Actress, producer and ‘champion of nature’ Dia Mirza, who has become a global name owing to her work in the field of environment protection, has been invited to be one of the speakers at the Social Good Summit 2018 at New York on September 23 this year. In her personal and professional life, Dia has always highlighted the cause ‘Beat Plastic Pollution’ in every way and has used her voice to spread this message far and wide. Dia strongly believes that youth is at the center of the solutions for the environment and can be the wave of change that is required. 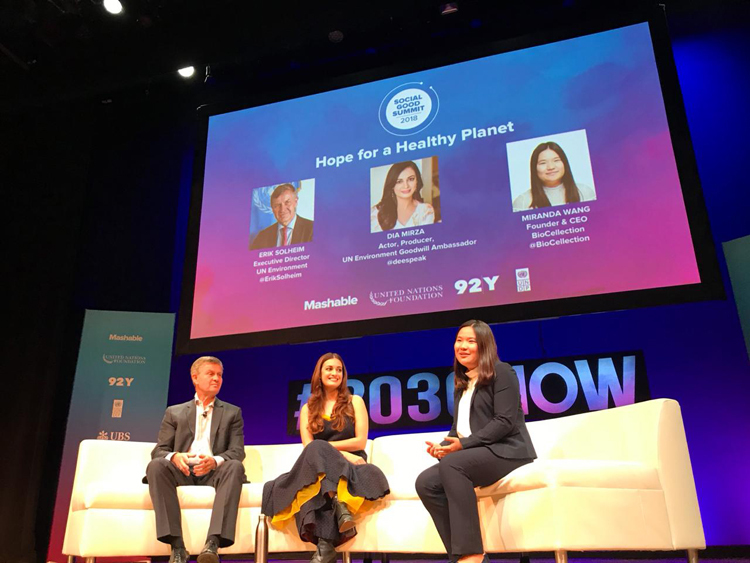 At the panel, they discussed the importance of building this awareness right from childhood helping them shape their conviction to champion the environment in every act. They also spoke of the need for successful advocacy and campaigns, like the #BeatPollution campaign around World Environment Day in India, to draw awareness to pollution and environmental issues. A session driven by solutions, Dia continues to be a strong voice for environmental conservation leading change across the world.